World music is a term is quite often used synonymously with ethno music, folk music and international music. fROOTS magazine famously described world music as “local music from out there.” The term world music was first used in the beginning of 1960´s in the academic world meaning: music other than Western music. This caused a movement of academics to diversify music education and research in the West. In 1980´s world music began to rise rapidly as a new genre of popular music following the Beatles-Ravi Shankar collaboration in the 60s. This caused many Western iconic musicians to make collaborations with musicians from other cultures, such as Paul Simon and South African musicians in the album Graceland. Globalization has made the extent of numerous far reaching cultures available to the sounds of World Music readily accessible. The resonant voices of world music was evident in the World Music Expo (aka. 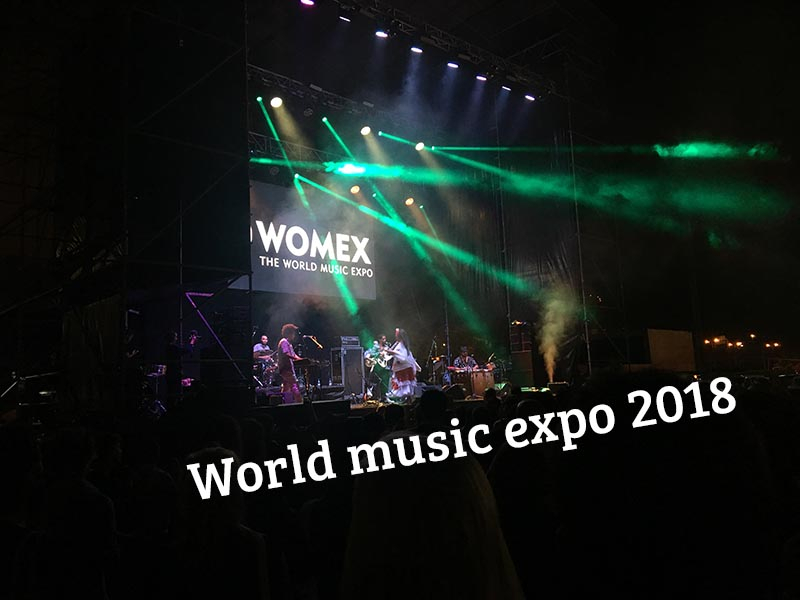 WOMEX) in Las Palmas, Gran Canary. Thousands of artists, record labels, agents, managers and other music professionals gathered on the island known by the Canarii as “The Land of the Brave” located in the Atlantic Ocean just off the coastline of Africa. The daytime was filled with conversation with artists and music industry people at Infecar conference center. Many musicians and companies had little knowledge about the music market in China. It was a surprise for most that western music streaming services and social media channels are forbidden in China. Many artists dreamed of traveling and performing in China, and some who longed to return told us interesting stories about their musical journeys through China. We learned that workshops for the cajón, a traditionally Peruvian box shaped percussion instrument, are really popular in China. One Colombian company was actually creating a cajón interactive education for the Chinese. Scandinavian folk bands had also toured in China, playing traditional instruments like the kantele. The evening program displayed numerous sonorous eclectic concerts by artists from around the world. The impression left on us by the Czech/Turkey/Serbian band, Invisible World, playing ethno inspired jazz music on the Theatre Stage was truly memorable. 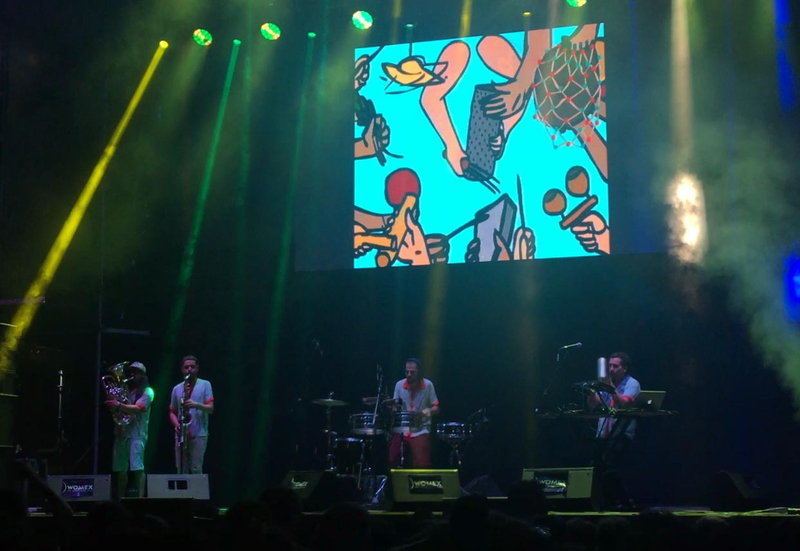 The outside stage had the warmest atmosphere with the conference visitors dancing through the night to the beats of Frente Cumbiero; Who’s music combines analogue drum machines and synths to classic samples from director Mario Galeanos vinyl collection, complemented with euphonium, saxophone and percussion. The somehow ominous music combined with grotesque cartoony animations, reminded us of Netflix series Narcos. The atmospheric open air concerts definitely highlighted the expansive cultural feeling present at Womex. The variety of people, culture and music all moving to that same world beat cried this collective experience through wild dance, voice and sound in the warm night of Las Palmas. During our trip the words: Oo Las Palmas, Oo Las Palmas, sun luoksesi lämpimään (engl. To get back to your warmth), a Finnish anthem about Las Palmas by Irwin Goodman, played in our minds. Now back in our cold dark Finland, we sure wish we could get back to you, ohh Las Palmas! Next year we will be prepared with winter clothing and flashlights as WOMEX will land in the streets of Tampere Finland.